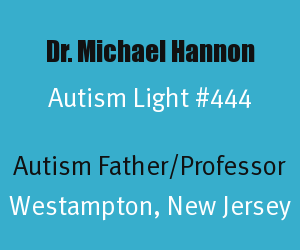 Autism Light #444 is Dr. Michael Hannon. When autism parents commence on the journey of raising a child with an autism spectrum disorder, they are put in a position, like Dr. King says, of needing to work and love their child persistently without being able to see all the growth and success their child with autism will experience over time. 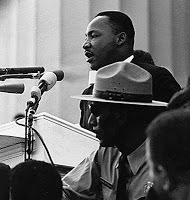 I believe if Dr. King were living today he would have acknowledged the unique challenges autism families face, and would have been especially engaged with how autism impacts families in the African-American community. King would have been very supportive of research into finding out the influences of autism on diverse family systems and would have been publically grateful for the efforts of the following autism father and researcher who is being honored for Martin Luther King, Jr. Day in 2016. 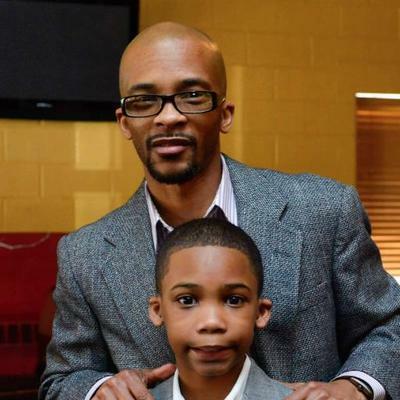 Dr. Michael Hannon is a professor and autism father from Westampton, New Jersey. He and his wife LaChan Hannon have a 13 year-old daughter Nile and an 11 year-old son Avery. Avery has a form of autism. Dr. Michael Hannon is an Autism Light for his research into the potential rewards of fathering a child with autism within diverse communities. Dr. Michael Hannon serves as the Assistant Professor of Counselor Education at Montclair State University, where his primary responsibility is teaching in the graduate level counseling program. He also serves as a mentor to doctoral students in their counseling doctorate program. Dr. Michael Hannon conducts research related to mental health and counseling and his research specialty is the influence of autism on broader family systems and fathers, with a particular emphasis on fathers and families of color. His website shows a summary of his previous work experience. Legacy of Dr. Martin Luther King, Jr. (MLK): Dr. Michael Hannon told Autism Light that MLK influenced his work in this way. Dr. Martin Luther King devoted his life, and particularly the latter part of his life, to an unapologetic fight for social justice. He was courageous to speak out and fight against racial discrimination, socioeconomic disparities, and war in revolutionary ways. His legacy influences my work in being able to share stories and experiences of an understudied and often misunderstood community: Black fathers of individuals with autism. There is important research about how autism affects family systems that includes highlighting disparities in diagnosis timing and access to care between racial/ethnic groups in the United States. While raising children with autism and other developmental differences can be challenging at times, the challenges might be exacerbated when we study the experiences of diverse parents. These exacerbated challenges may be based, in part, by negative interactions with service providers (e.g., teachers, therapists, etc.) that undermine trust between parents and service providers (Michael Hannon, January 13, 2016). Education: Dr. Michael Hannon has completed the following educational degree programs. Author: Dr. Michael Hannon has been the author or co-author of over 25 presentations, book chapters, and/or articles on the area of his expertise in counseling, mental health, and autism families. Michael Hannon’s Ph.D. dissertation was Just Love Him and Everything Else Will Fall Into Place: An Analysis of Narratives of African-American Fathers of Children with Autism Spectrum Disorders (read or download the paper from an online library collection at the link provided). This became the first empirical study to capture and communicate the narratives of African-American fathers of children with ASDs specifically for counselors and counselor educators. Another practical research paper by Dr. Hannon is online called Supporting Siblings of Children with Disabilities in the School Setting: Implications and Considerations for School Counselors. The most rewarding aspect of fathering individuals with autism is seeing their children successful. There is an orientation and adjustment process that fathers experience as they learn about their children’s autism diagnosis and possibly have to adjust their relationship expectations with their children with autism. Fathers seem to appreciate connecting with resembling fathers and families as they navigate fathering an individual with autism. Certifications: Dr. Michael Hannon is a National Certified Counselor (NCC) and a Licensed Associate Counselor (LAC) in New Jersey. Awards: Dr. Michael Hannon received the Presidential Award by the Willingboro, New Jersey and Vicinity Branch of the NAACP in November 2015. Conference Speaker: Dr. Michael Hannon provided the keynote at the 3rd Annual Conference for New Jersey Fathers of Children with Special Needs in October of 2015. Below is a brief excerpt of his presentation. More information on past conferences he presented at are listed on his blog. Great Expectations Teaching & Advocacy Center for Childhood Disabilities, Inc. (GETAC): Michael and LaChan Hannnon founded GETAC on April 19, 2007 to offer advocacy, educational, and consultative services for parents raising children with developmental disabilities. Michael’s wife, LaChan Hannon, serves as the Executive Director and the work of this non-profit is dear and near to them. The following is a video of Google Hangout where Dr. Michael Hannon was on an online panel called Autism Brainstorm: Guy Talk that Dr. Robert Naseef did in March 2015 as part of a feature on an African-American perspective on raising children with autism. A second part of this series was taped in April 2015. Advice to Autism Fathers: Dr. Michael Hannon shared this advice to autism fathers with Autism Light. Learn (more) about themselves so they can engage with their families in healthy and honest ways. Discover (or rediscover) interests, hobbies, stress relief activities, and ways to support personal growth and development. Learn about their children (with or without autism) so they can find connection points. Fathers may find they share interests, attitudes, dispositions with their children, which is awesome. They also may discover something their children enjoy that eventually becomes a mutual interest or something in which they entirely support their children. “Life’s most persistent and urgent question is, ‘What are you doing for others?'”. Others Supporting Autism Families: Dr. Michael Hannon provided this insight to Autism Light on supporting fathers in diverse communities. I appreciate the ongoing advocacy for individuals with autism by individuals with autism, their families, and concerned community members and groups. One way we can all continue to help families affected by autism is being courageous in helping eliminate the disparities in diagnosis, diagnosis timing, and access to care for families of different racial/ethnic groups. Another way to help is to continue balancing the autism narrative. All families experience stress, and raising an individual with autism can be stressful at times, and in different ways than raising an individual who does not have autism. However, the stress/coping narrative is not the only autism story. It’s great to be able to read, hear, and talk to those living with and/or affected by autism when they share their success and reward stories (Dr. Michael Hannon, January 13, 2016). One last suggestion for all of us is to affirm the humanity of individuals with autism, by using people-first language. Unless I’m corrected, I try to address people with autism with that moniker: people WITH autism. I get concerned when we label a community by just one identifier, especially when that identifier has been constructed as something negative (e.g., autistic, diabetic, schizophrenic, etc.). Those identifiers can be sources of pride for the individuals living with such conditions and contribute to our diverse communities; however, I err on the side of caution and try to use people-first language in my interactions and recommend others do the same unless told otherwise (Dr. Michael Hannon, January 13, 2016). Special thanks to Dr. Michael Hannon for being an Autism Light and fighting the good fight as an autism father, researcher, and counselor. His work is a benefit to the autism community and he is an appropriate representative of someone who has a passion to shape the world for the better like the great Dr. Martin Luther King, Jr.
King Richard (Person with Autism). Autism Light honors diverse heroes to the world of autism. Wikipedia and is from the National Archives and Records Administration. The photo of Michael Hannon is used with permission of Michael Hannon.